After a long silence I finally released a new version of the addon. It might not show much on the outside, save the rendering of the task list window, where the previous pixelated display is gone. More or less everything else was rewritten from scratch under the bonnet. I refactored the code base to allow for more structured programming approach. The ugly rendering of the task list has been replaced with the built-in JavaFX webkit based browser, that is not only better looking and faster, but the add-on doesn’t have to ship with a 1M bulk. Starting this release the window several features were added to support side by side usage. The position of the task list can be saved, so if it’s closed it will open on the last screen position and use the same size. The window no longer closes when selecting a task, so it’s useful for navigation in the map. Task parsing, editing, archiving will refresh the task window straight away. If you like the addon, don’t forget to honor the work put into it by donating to the author. A new minor version of the addon is released, that resolves an interesting issue visible on Freeplane 1.6.1-alpha and later. After a little break the add-on is back with new features. New version of the Freeplane GTD is released, this version features French translation by Marian Llabrés. The add-on is available here. 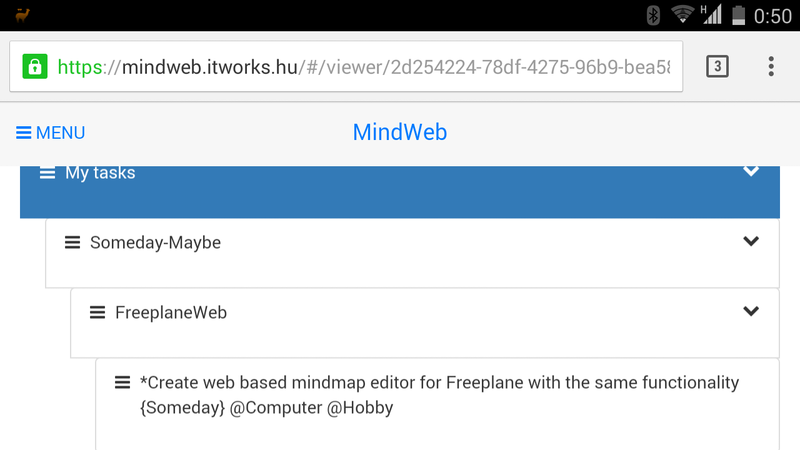 This is the initial announcement of the availability of the first working version of a HTML 5 based freeplane viewer/editor. I’ve been using Freeplane quite heavily, and it always caused a headache, that there is no way of accessing my maps from my phone or tablet. The only viewer available used Java applet, which is not even available on the desktop browsers anymore. That’s what brought this project to life, and the roadmap is even more exciting for both Freeplane fans, and GTD practitioners. Basic GTD template added to add-on. More about using the template here. As usual the add-on is available on the release site, or on GitHub. You can use this direct link to download the add-on. Thanks to Miguel Molina’s translation efforts, the add-on is now available in Spanish!